This flavor wasn’t created as a gimmick or as a joke, in fact, it was created out of pure desire to see if we could make something this far out, actually taste good. 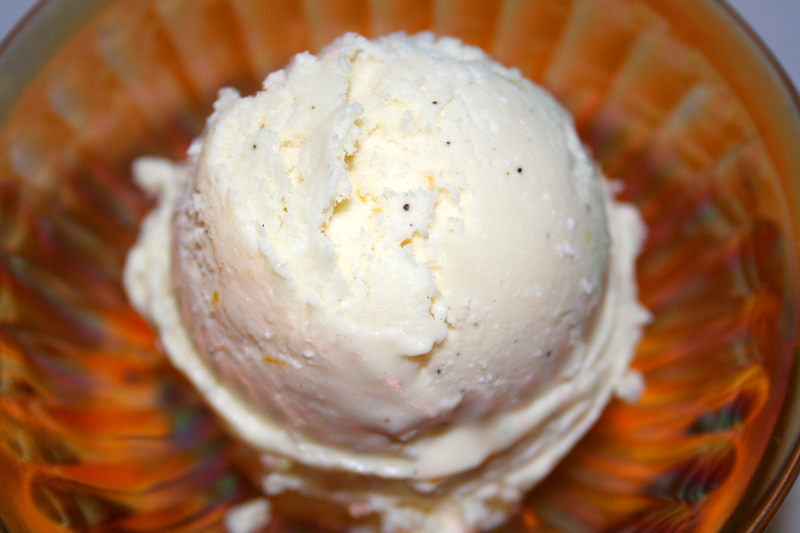 We realize that the public’s taste for Cheeseburger ice cream might be nil, but much of the point of these weekly releases are to give you an idea of our thought process when we concept, and ultimately create a flavor. Once in awhile our ideas fall flat, and those get left on the kitchen floor, never to be posted here or created at all for that matter. This one, in our opinion, did not. It all started with a discussion on the consumption of shakes and malts while enjoying a burger and fries. Many of you willingly slurp down ice cream as a means to wash down a cheeseburger, even dipping fries in it. 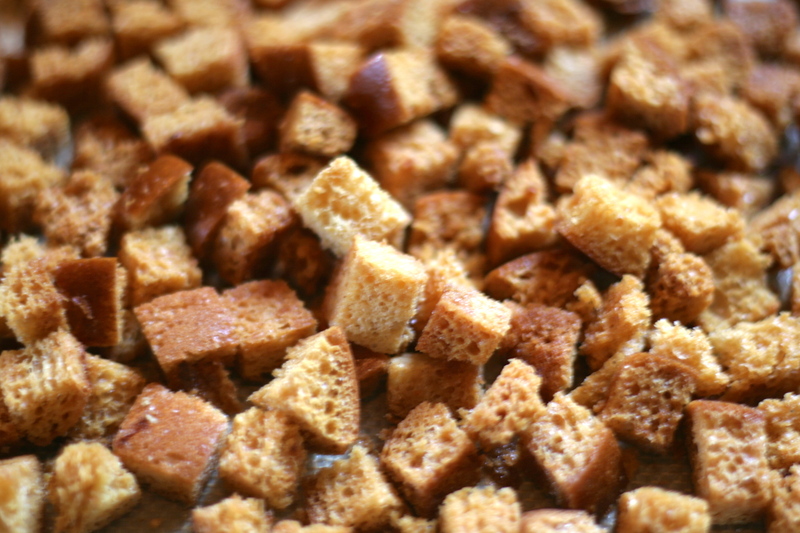 In some ways, the meal and the dessert are synonymous. So why wouldn’t this flavor work? We had to try. The concept was narrowed down to a few important factors. 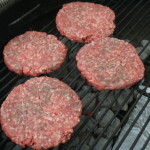 We agreed that steeping a burger would be the approach to get the flavorful fat and flavor to soak into the cream- the beef, the smoke, the char, and the cheese. 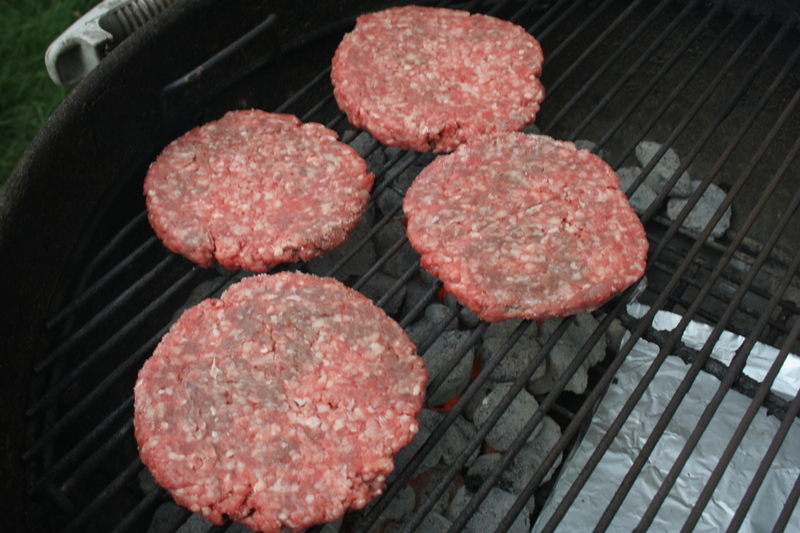 So, we had some cheeseburgers. 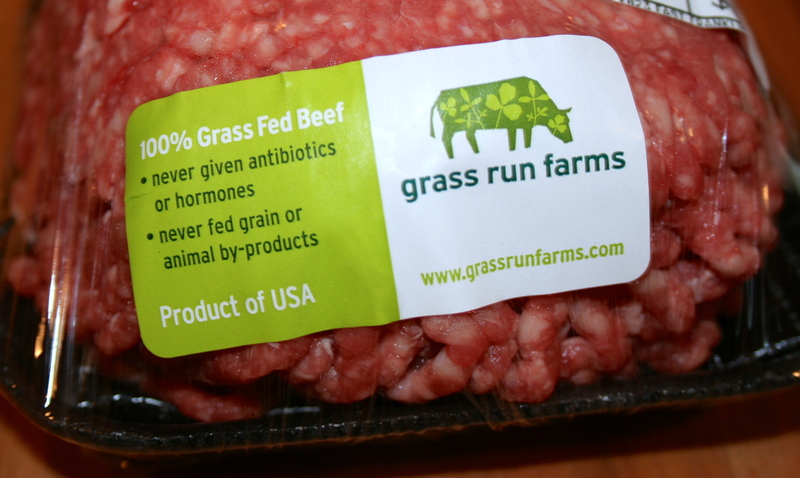 Obviously we start with quality ground beef, and Grass Run Farms is a good one. 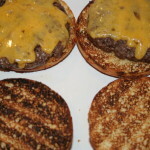 The burgers went on a hot charcoal grill and were topped with Wisconsin Cheddar. 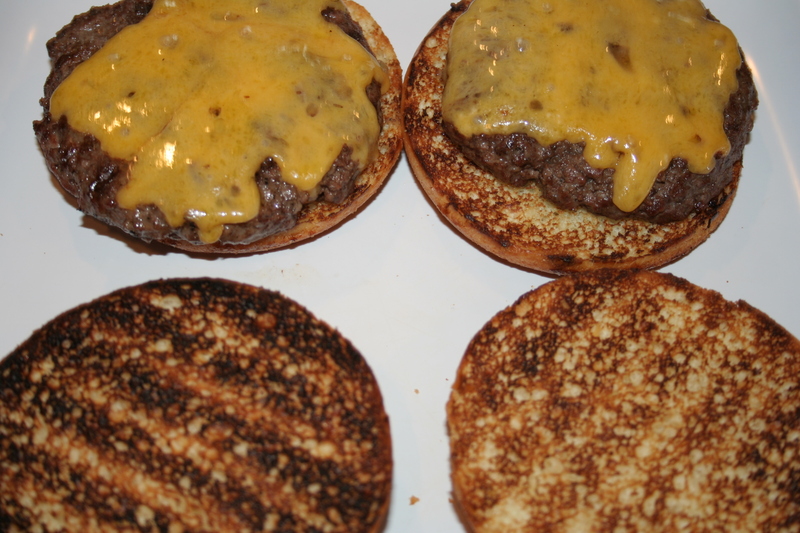 We ate some of the cheeseburgers. 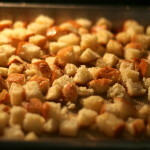 Then we took the two left over and kept them to steep in the ice cream base. 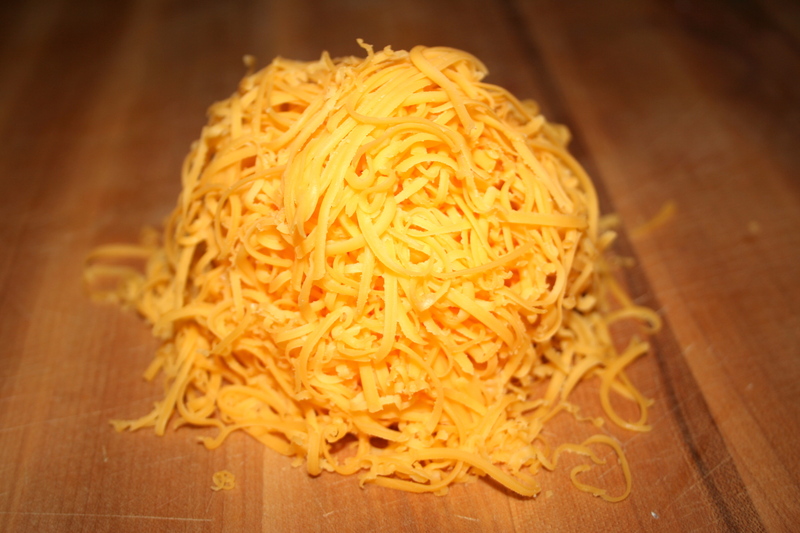 Being Wisconsin boys, we knew there had to be more cheese, so we tailored our ice cream base to accept more of this fine cheddar along with the grilled grass fed patties. 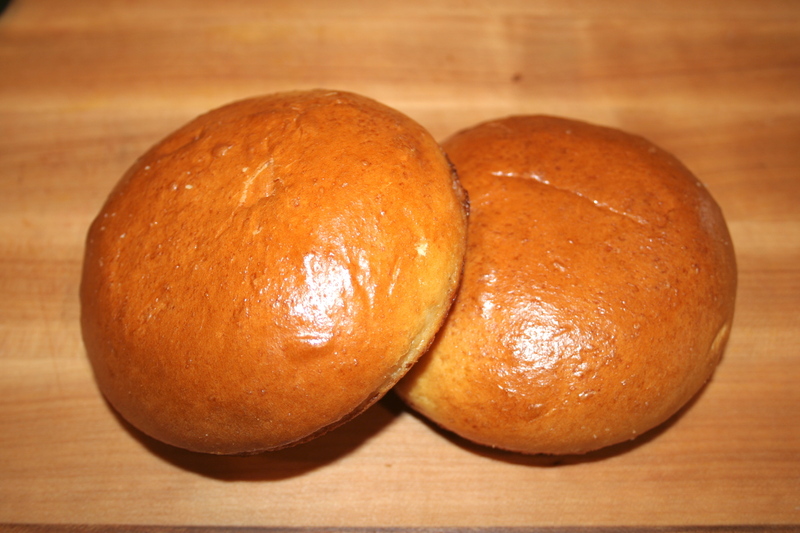 Don’t worry, we didn’t forget the bun. 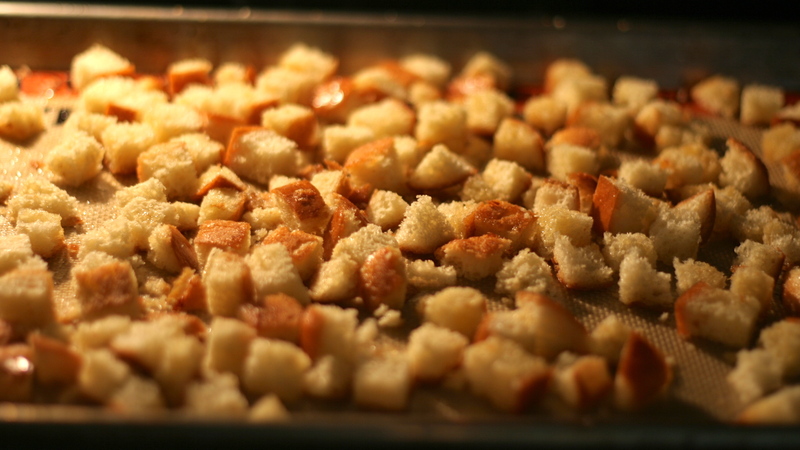 For this, we took our favorite New French Brioche Buns and baked them off into croutons with some help from our friends butter and salt. They went in at the end of the churn. And here it is. A creamy, dense cheddar cheese ice cream steeped with charcoal grilled, grass fed beef patties and specked with brioche bun croutons. A sweet ice cream that ever so subtly reminds you of a cheeseburger. Of course, you want to know – what did we think? It IS good. Honestly it wouldn’t be my first choice, and isn’t for eating in mass quantities – but its a blast to try and experience the brain tease. Want to try it? You can win one of the only two pints in the world, filled with this fabulous, scratch made craft ice cream in our weekly pint giveaway. Enter your name in the comments section here, or on our facebook page under the posted contest. 2 lucky winners will be drawn randomly on Friday 7/25/13 at 4pm. Winners must be able to pick up locally and give us feedback. Pints must be claimed by email within one week or we will redistribute. 🙂 Good luck! A few weeks back, we released our Coconut Bar w/ Banana Caramel, a flavor inspired by a mid-winter trip to Mexico and the coconut bar from the gods. 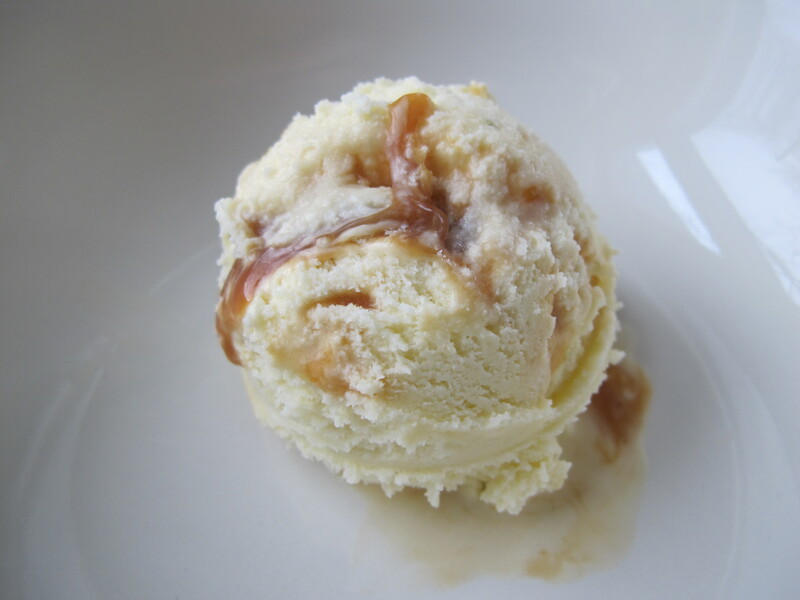 This week, it’s another Mexican-inspired flavor, as we craft a rice milk ice cream and a goat milk caramel made with local goat milk from our faves, Singing Hills Goat Dairy. Let’s get started with this week’s flavor: Horchata with Cajeta! 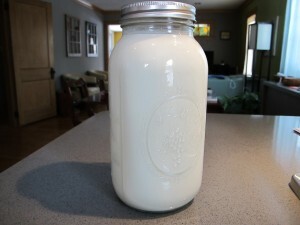 Before we assume that everyone has had Horchata, let me just give you a brief run down. It’s really good and tasty. Ok, are we good then? 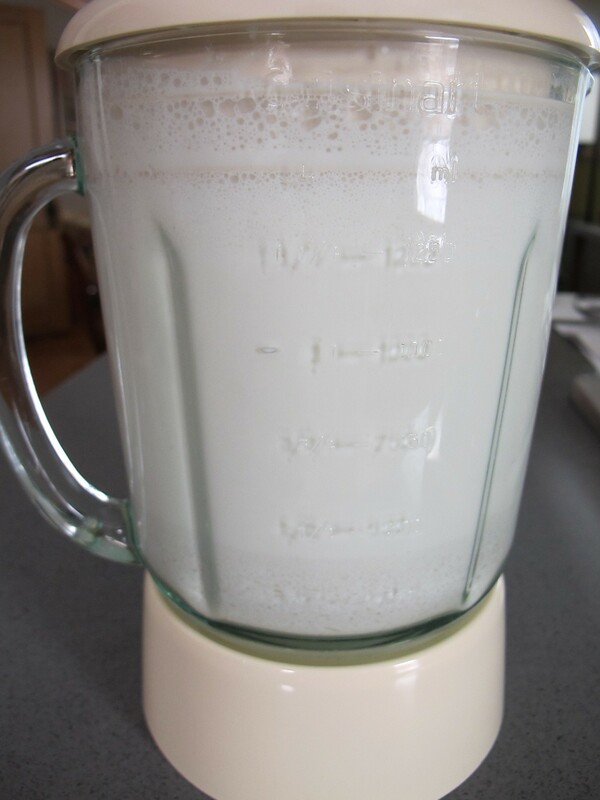 I mean it, but seriously, Horchata is a beverage that is found in many Latin American countries along with Spain. It’s made in many different ways using either ground rice, seeds, almonds, etc. Probably the most commonly found version of Horchata here in the US is the Mexican version; which utilizes ground rice, water, milk, sugar, cinnamon and sometimes vanilla. 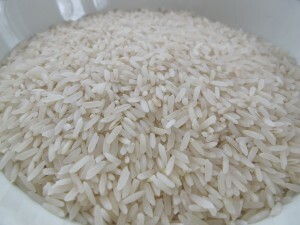 For our ice cream base, we used long grain white rice pictured above. We pureed the rice in a blender with our cream, added a few cinnamon sticks and let steep overnight in the refrigerator. 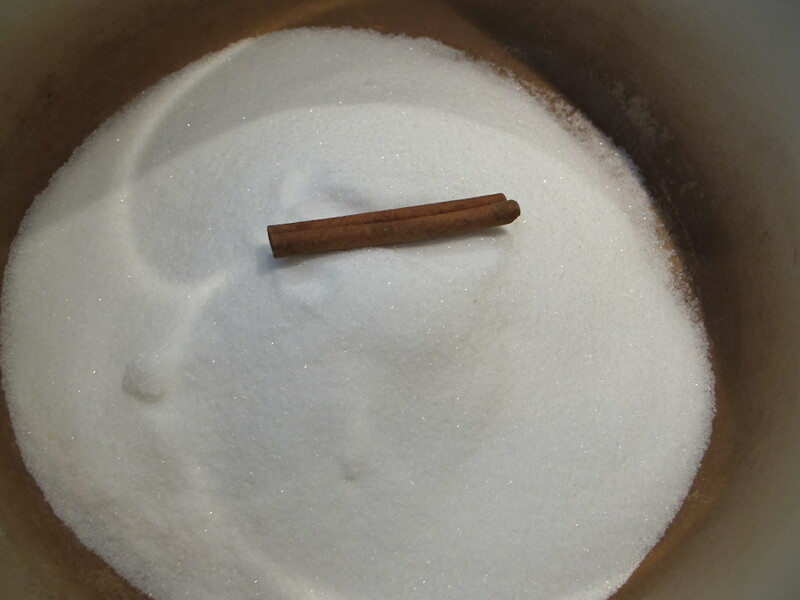 We make our organic cane sugar base, add the strained rice cream and a touch of ground cinnamon, and our mix is ready for the churn. Next, it’s time to make our Cajeta. 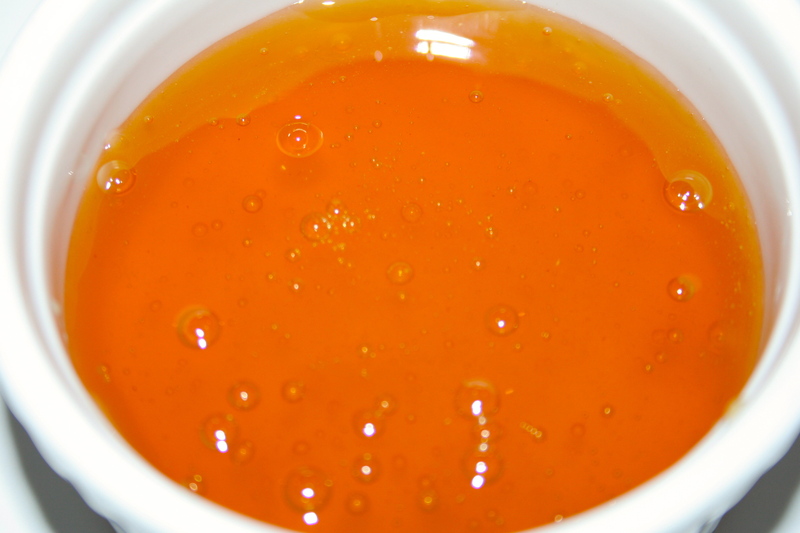 Cajeta? It’s a Mexican caramel/syrup made by slowly simmering milk and sugar for a long period of time. 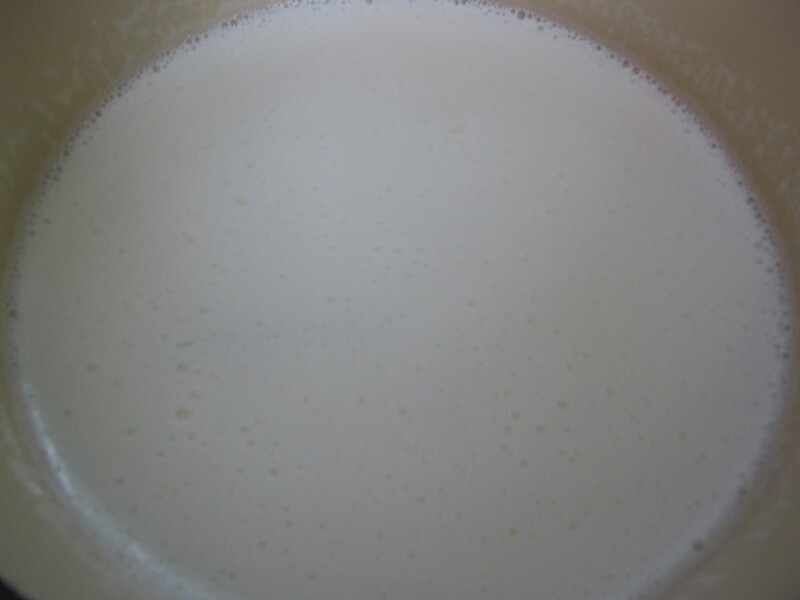 This isn’t going to be just any ordinary Cajeta though…we’re making a goat milk cajeta with Singing Hills goat milk. Lynne Reeck and Kathryn Wall are Singing Hills’ owners. 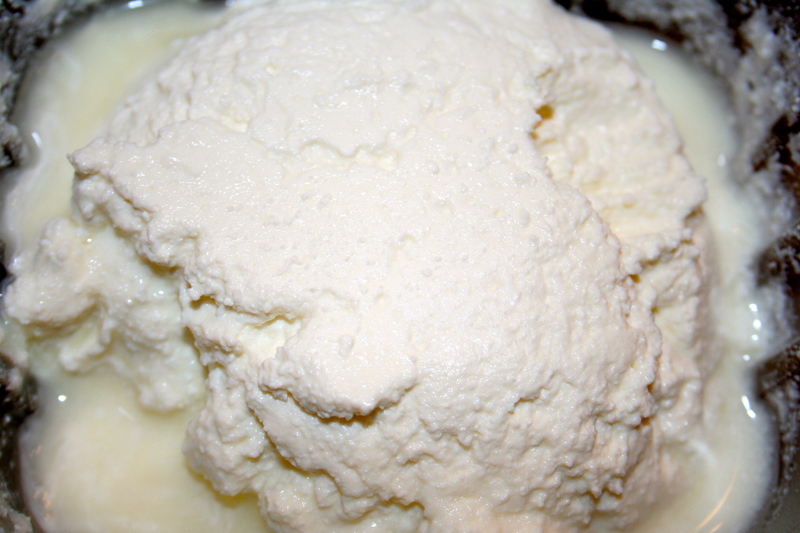 In our opinions, they are making the best fresh goat cheese around. “Like” them on Facebook, go buy their cheese at Mill City Farmers Market, Fulton Farmers Market, and Kingfield Farmers Market, and check out this great article about them from Heavy Table(Lynne Reeck of Singing Hills Goat Dairy). 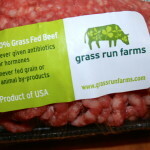 And please, help support our local farmers. Thanks to them, and of course Lynne’s sister Nancy, for her door-to-door delivery, we got our hands on a quart of their tasty goat milk for Cajeta-making. 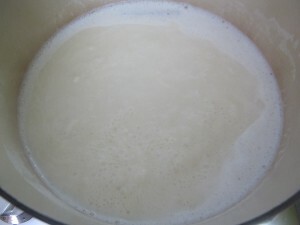 The sugar, goat milk and cinnamon stick are mixed and brought to a simmer. For comparison sake, I wanted you all to see the transformation of the Cajeta over a 60-80 minute period of simmer down. 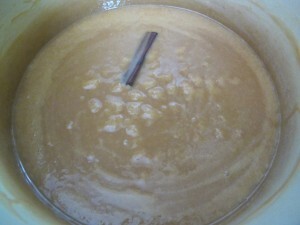 It’s color becomes darker and darker until finally the Cajeta has reached full caramelization. 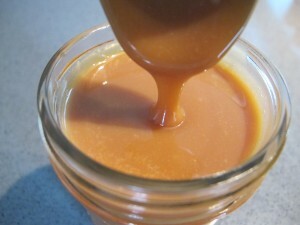 Singing Hills Cajeta! It kind of makes me speechless it’s so good. It’s much different from a traditional caramel. 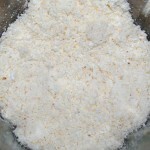 It’s lighter, and has a beautiful clean finish, with a slightly tangy acidity to it. It’s something we hope to have around a lot in years to come as our business grows. 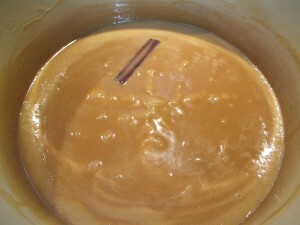 The Cajeta gets layered into the pints during packaging. Boom! Horchata with Cajeta! 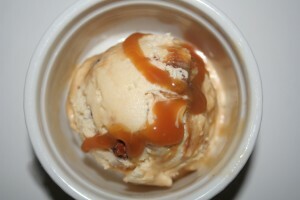 Creamy rice milk ice cream layered with Singing Hills goat milk caramel. It’s a little bit of Mexico and Minnesota all in one pint. Want to try it? You can win one of the only two pints in the world, filled with this fabulous, scratch made craft ice cream in our weekly pint giveaway. Enter your name in the comments section here, or on our facebook page under the posted contest. 2 lucky winners will be drawn randomly on Friday 3/29 at 4pm. Winners must be able to pick up locally and give us feedback. Pints must be claimed by email within one week or we will redistribute. 🙂 Good luck! There were more potential flavors on this list, but these were the only ones that I saw. Translation: Poppycock! At least that’s how I first imagined it – popcorn (awesome) and nuts (even better) all covered in caramel and/or toffee (party). 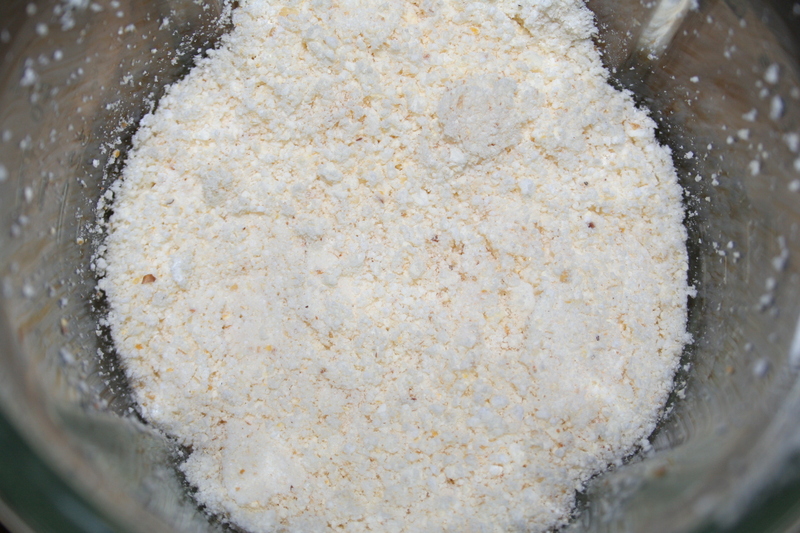 We were going to hearken back to one of our first flavors on this blog -Brown Butter Popcorn – and make a Poppycock version of it. Time to make some ice cream. First. The popcorn. 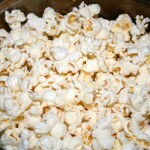 Popcorn is a mutual staple in Steph’s and our households and we’re both fans of flavoring it with brown butter. It was an obvious choice as the main elements of the ice cream base. 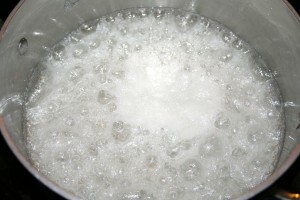 The first step in making this particular base is taking fresh pan popped pop corn, not microwave popcorn, or air popped, but popped old school in a pot with hot oil. Why? 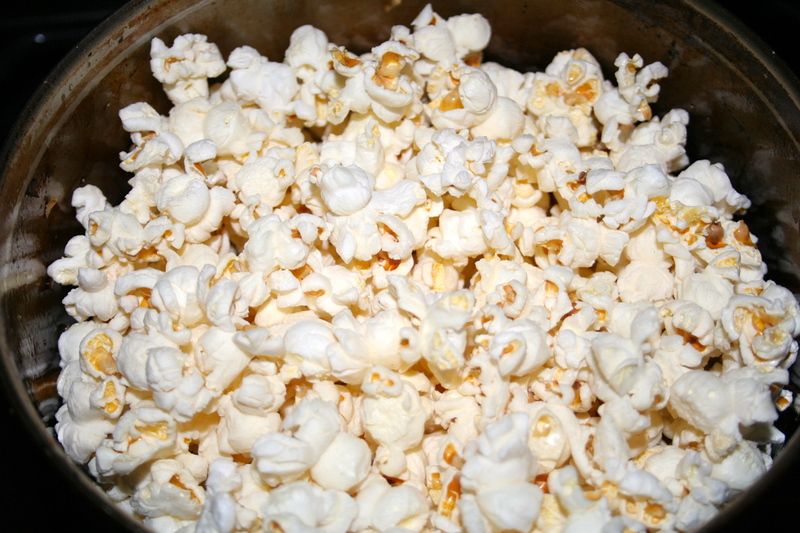 Because you get the most natural, classic popcorn flavor from the oil cooking the corn over heat. Microwave popcorn is totally out of the question for many reasons, (no thanks butter “flavor”) and airpopped just won’t provide enough oomph. 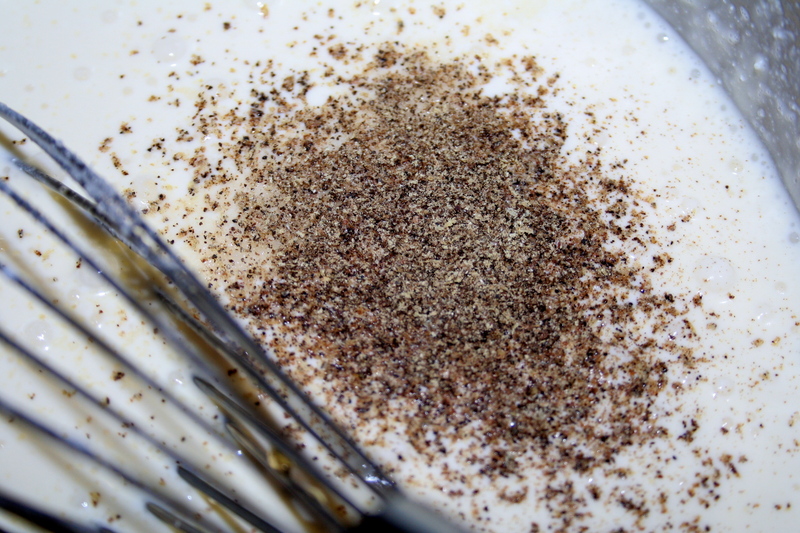 Once it’s popped, we pulverized it in a blender and then mixed into the base and steeped to extract as much of the flavor into the cream as possible. 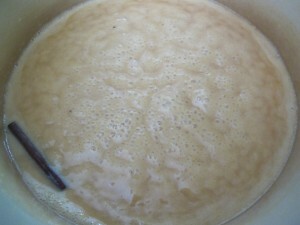 While the base is heating/steeping, brown butter is whisked in. The brown butter is such an incredible flavor on its own, and combined with salt makes the popped corn flavor much more prevalent, which is exactly what we want. 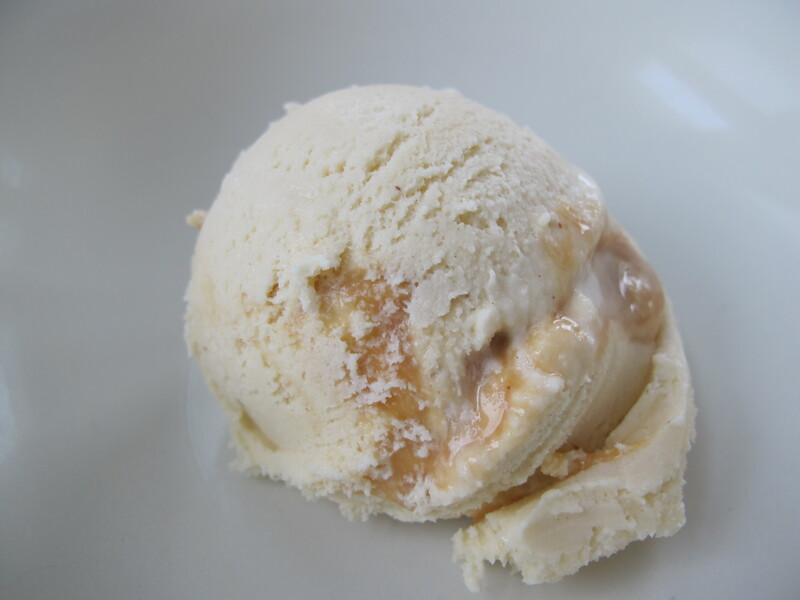 For this flavor we’re sticking with a classic caramel – with plenty of salt. We chose to candy the almonds whole, since the true prize of poppycock is the toffee coated nuts. 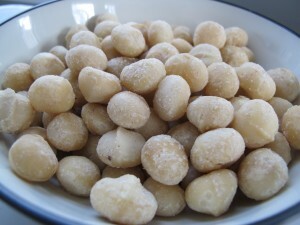 The caramel is swirled into the brown butter popcorn base and the nuts are peppered throughout. The moral of the story? Ice Cream is just as right for a cold, snowy night in March as it is a warm dusk in late June. 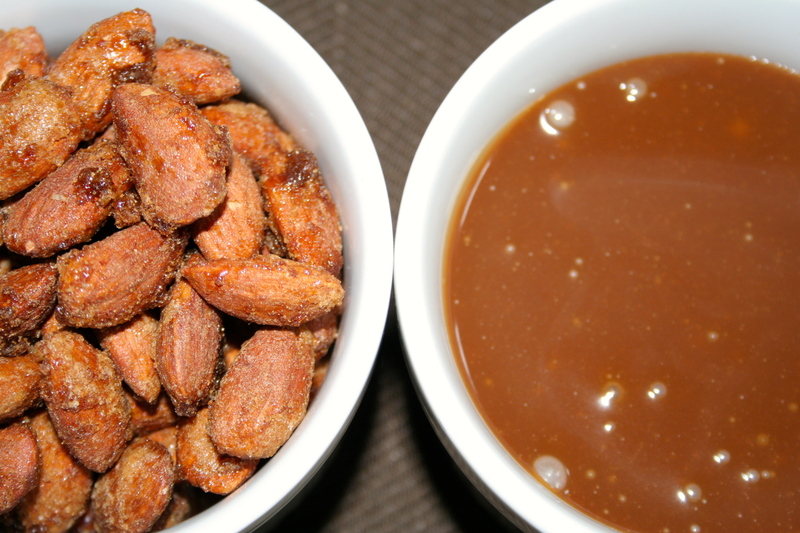 Popcorn, Brown Butter, Almonds, Caramel mean victory. This one is a champ. A buttery, popcorn infused ice cream with heaps of whole, candied almonds and ribbons of salty, gooey caramel. Want to try it? You can win one of the only two pints in the world, filled with this fabulous, scratch made craft ice cream in our weekly pint giveaway. Enter your name in the comments section here, or on our facebook page under the posted contest. 2 lucky winners will be drawn randomly on Friday 3/8 at 4pm. Winners must be able to pick up locally and give us feedback. Pints must be claimed by email within one week or we will redistribute. 🙂 Good luck! 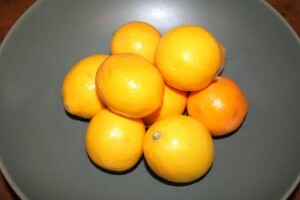 Since we’re on the citrus kick, I’ve dug up a flavor that I’ve contemplated for nearly a year. Meyer lemons are one of my favorite citrus fruits and I wanted to make an ice cream that didn’t have swirl or a syrup, but was straight up flavored with the fruit. We’re no stranger to incorporating cheese in our ice creams either, but this marks the first time we’ve used Ricotta. Its sweet mild flavor seemed like a nice way to balance the sweet and sour of the lemon, and black pepper is a way to finish it off with a little bite. 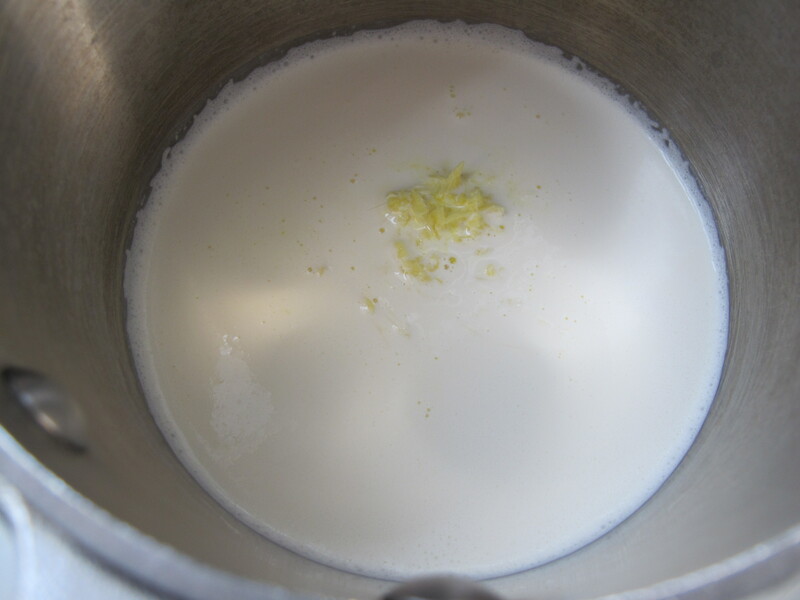 we also juiced the lemons and reduced them into a syrup to further intensify the lemon flavor once added to the cream. You can win one of the only two pints in the world, filled with this fabulous, scratch made craft ice cream in our weekly pint giveaway. Enter your name in the comments section here, or on our facebook page under the posted contest. 2 lucky winners will be drawn randomly on Friday 2/8 at 4pm. Winners must be able to pick up locally and give us feedback. Pints must be claimed by email within one week or we will redistribute. 🙂 Good luck! We are going to keep the beach vibes going this week to shed more warmth on these harsh winter months. Recently we rolled out our Coconut & Mangosteen Caramel, Jasmine Citrus Saffron and Georgia Walnut. This week, we’re back at it with another tropical inspired flavor jumble with our Lime w/ Macadamia and Ginger Caramel. Let’s do this! Lime lime! 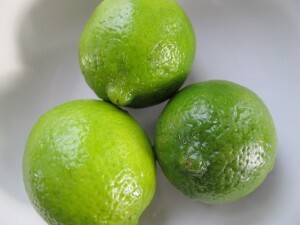 Limes! 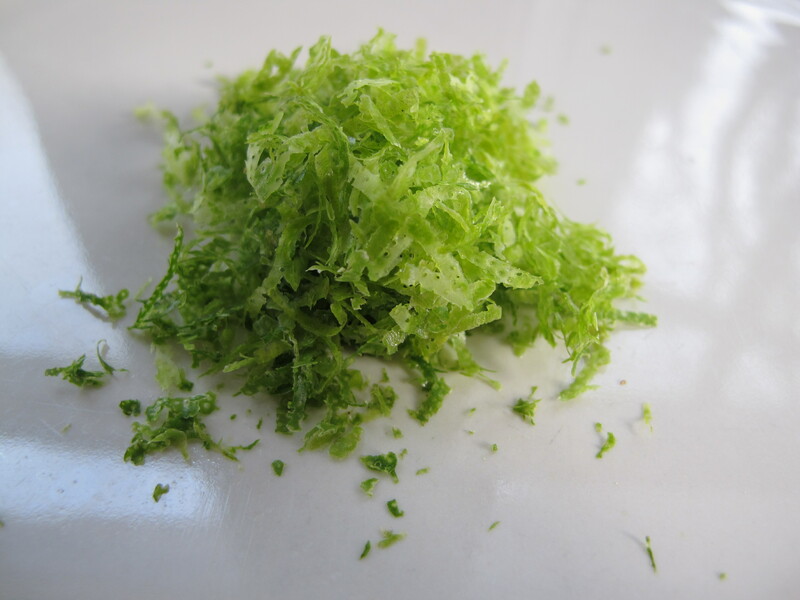 Lime! So these are limes. First, we zest. Then, roll them out and juice em. 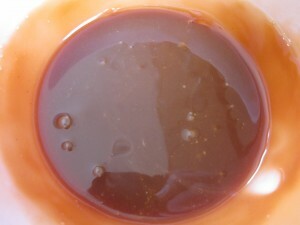 The juice is poured into a sauce pan with equal parts sugar, then reduced into a syrup. The syrup and lime zest are both added to our ice cream base to ensure full lime limeness. It’s ready for the churn. 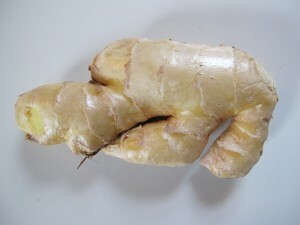 Ginger! I had been watching Top Chef a few weeks back and for those who are familiar, there are contests every episode called “quickfire” challenges. 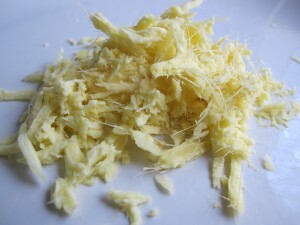 This one in particular made use of ginger. Someone on the show made a ginger caramel, and I instantaneously knew that this was going in one of our next flavors. 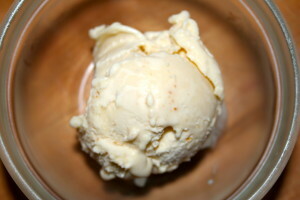 This week’s flavor was designed around the idea of this ginger caramel. 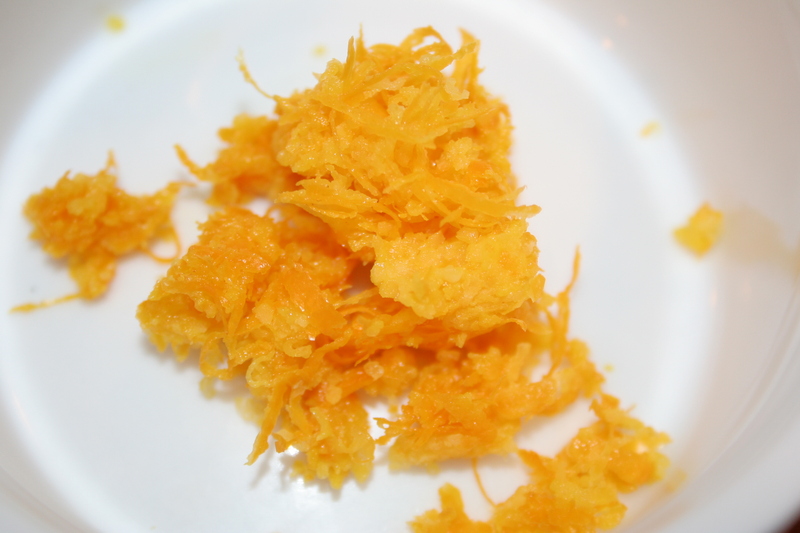 The process was not divulged on the show, but we’ve made caramel hundreds of times, and intuition had me peeling and grating the ginger first. Next, the ginger got heated with cream, steeped to fully infuse, and then strained out of the cream. Next, we made a traditional caramel by boiling plain granulated sugar until caramelized. 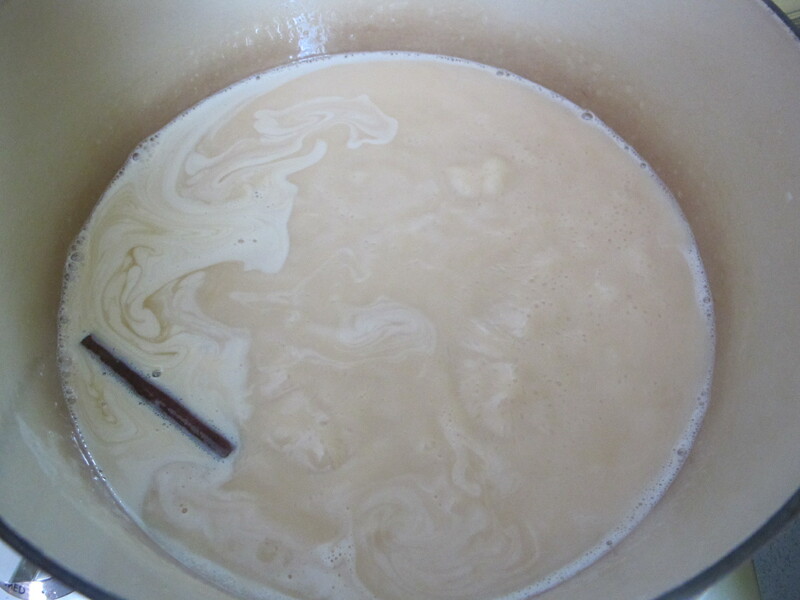 The ginger-infused cream is then added into the boiling caramelized sugar, salted, and bang-go! 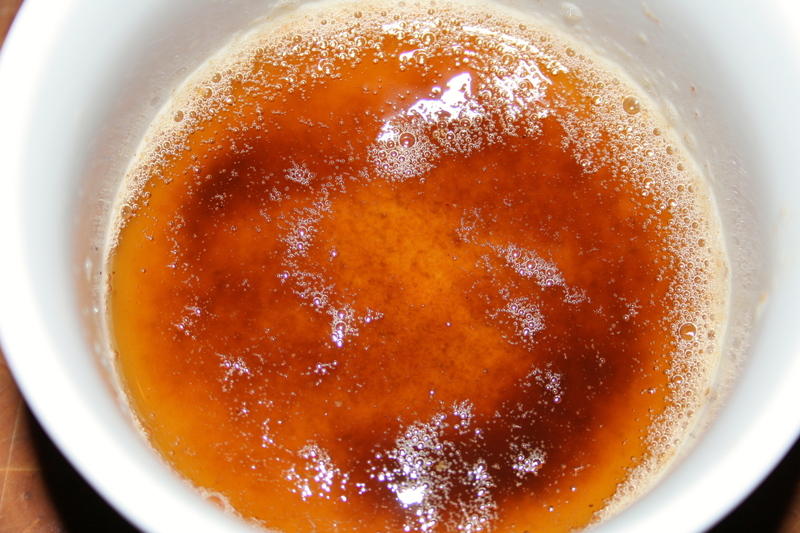 Ginger caramel! Our last addition – macadamia nuts. 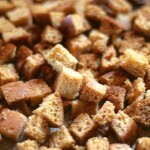 They add texture and crunch. 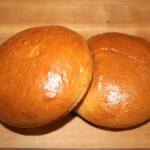 Their nutty buttery flavor hits at the end of each bite. 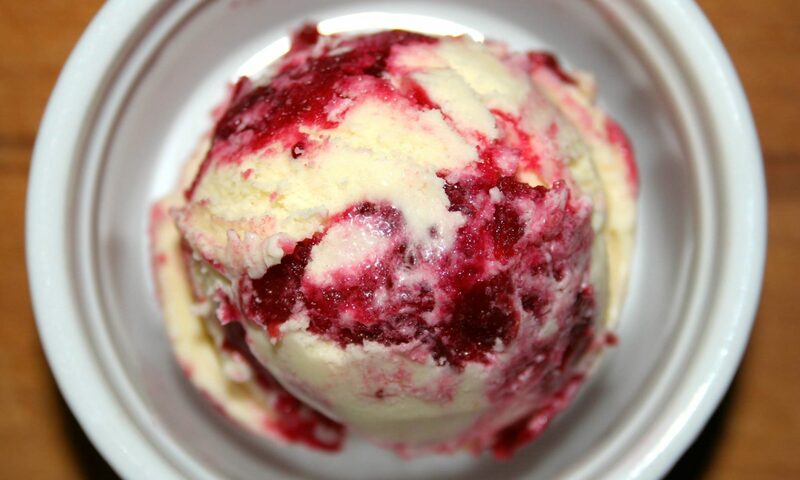 We keep them plain and simple, and add into the ice cream at the end of the churn. The results are in…rich and creamy lime ice cream layered with salty ginger caramel finished with the crunch and nuttiness of buttery macadamia nuts. Summer’s favorite flavor? Nah, winter’s favorite flavor. You can win one of the only two pints in the world, filled with this fabulous, scratch made craft ice cream in our weekly pint giveaway. Enter your name in the comments section here, or on our facebook page under the posted contest. 2 lucky winners will be drawn randomly on Friday 2/1 at 4pm. Winners must be able to pick up locally and give us feedback. Pints must be claimed by email within one week or we will redistribute. 🙂 Good luck!